Valiant is proud to announce the launch of “Renegades” in Harbinger #6 – the FIRST ISSUE of an all-new arc by New York Times best-selling author Joshua Dysart (Unknown Soldier) and artist Phil Briones (Sub-Mariner)! After the epic confrontation between Peter Stanchek and Toyo Harada, the Valiant Universe’s first team of heroes is going to make it their mission to dismantle the Harbinger Foundation brick by brick! 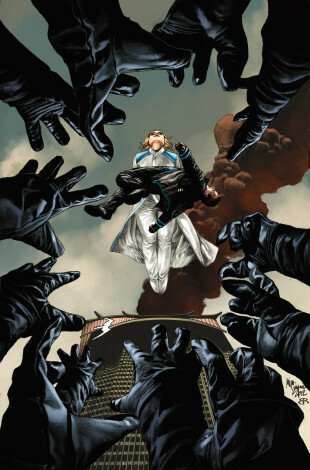 The all-out war against the Harbinger Foundation begins this November with “Renegades,” kicking off in Harbinger #6! And as each new issue introduces a new member in Peter Stanchek’s rogue band of heroes, look for a new interlocking cover by Mico Suayan for issues 7 through 10. For information on all of Valiant’s upcoming releases or to locate your local comic shop, visit ValiantUniverse.com. HARBINGER #7 – ON SALE IN DECEMBER!